T-Shirt: Every competitor gets a T-shirt. Goody Bag: Every competitor gets a T-shirt. Post event expo and festival: There will be a small post race expo and festival. 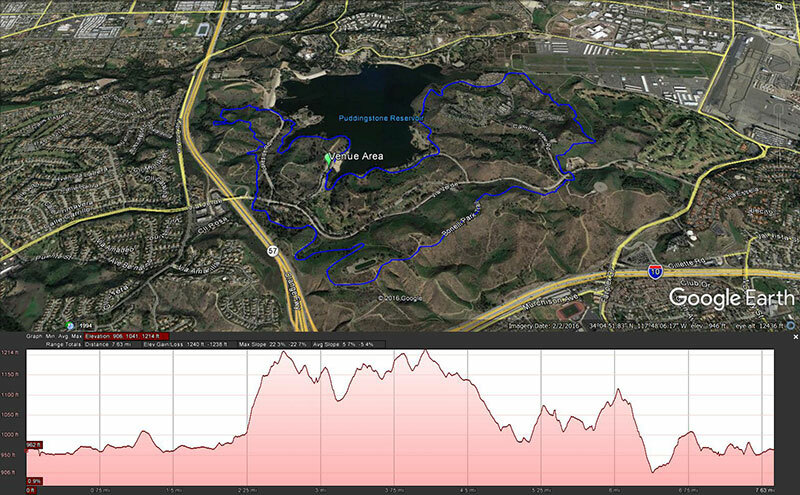 Trail Run Challenge: 3-miles or 6-Miles with lots of hills and a more scenic lake and mountain views. 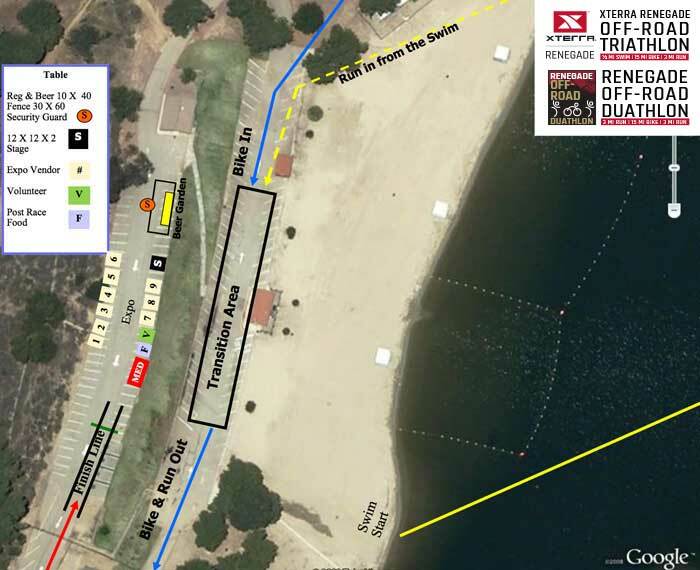 Off-Road Triathlon: This 1/2 mile swim, 15 mile (2-loop) bike and 3 mile trail run is challenging enough for the seasoned triathlete yet short enough to entice novices. The mountain bike course has a beginner/intermediate rating. 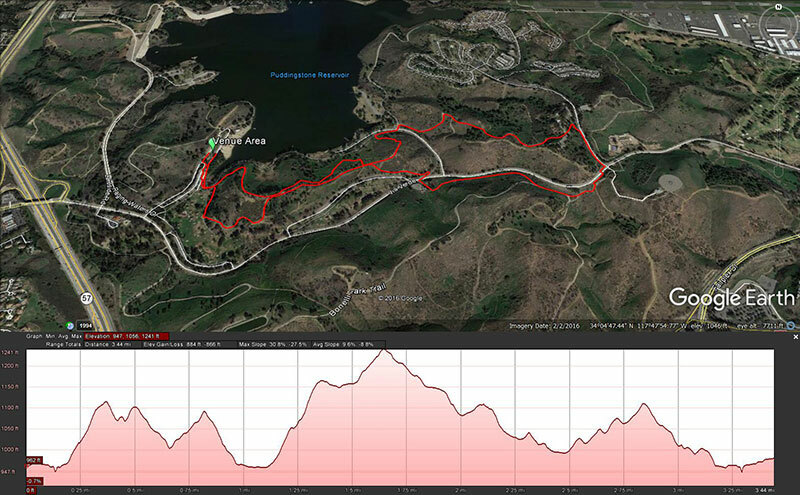 Off-Road Duathlon: The same course as the Renegade Off-Road Triathlon but with a 3.0 mile run, 15.0 mile (2-loop) bike and finishes with another 3.0 mile run. How to get there: Exit Via Verde from CA-57 and follow the signs to Bonelli Park. Enter through the park gate on Via Verde (South Side). Make the first left at Eucalyptus and park. Additional parking will be available further east on Via Verde. Parking: Bonelli Park charges a $10/vehicle park fee, please carpool when possible. Off road events: We recommend good off-road equipment such as trail running shoes and a mountain bike. 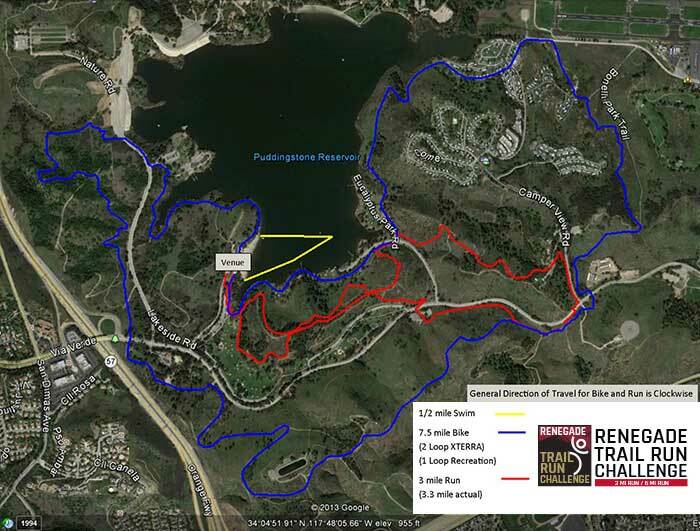 Age requirements: Renegade Trail Run Challenge is open to those 12 and older (younger OK if accompanied by an adult). Age divisions: Age categories are divided into 5 year age groups based on age on race day. Age groups 20-24 and going through 85+. Additional age groups are 11 and under, 12-14, 15-17 and 18-19. Awards: There are awards for the top 3 competitors in each age category. Early packet collection: Participants may not pick up a family member’s or friend’s race items at early packet. Packet collection: The participant must do all race day bib and timing chip pickups and must show photo ID at packet pickup to receive your bib, timing chip and other items associated with the events. Children without photo ID: Parents of children without photo ID may pick up race items on their child’s behalf. Bib numbers: Bib numbers are required to participate and those who attempt to participate without bib numbers will be removed from the course. USAT: All Renegade Racing triathlon events are USA Triathlon Sanctioned events and are subject to USAT rules. Headphones: For safety reasons headphones are not permitted. How was Renegade Off-Road Triathlon, Duathlon & Trail Run Challenge?